PETERSBURG [Hale Co.]—Sid Alford, 65, of Petersburg will be at 2 p.m. Tuesday, September 18, 2012 at First Baptist Church in Petersburg with Dr. Don Raney officiating. Burial will be in Petersburg Cemetery under the direction of Bartley Funeral Home of Plainview. Mr. Alford passed away on Sunday September 16, 2012 in Petersburg. Sid was born October 2, 1946 in Lubbock to John and Nalta Alford. Sid was a member of the United States Air Force for three and a half years as an instructor. 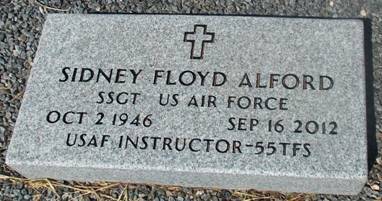 He was stationed in, Wichita Falls at Shepard AFB, Lackland AFB in San Antonio, served as an instructor in Amarillo and served at Wetherfield AFB in England as part of the USAFE (US Air Force Europe). He was part of the Tactical Air Command in England, Italy, Libya, and Turkey. Sid received four medals in the Air Force, the Presidential Unit Citation, the Good Conduct Medal, the Overseas Medal, and the National Defense medal. Sid was a founding member of the American Air Museum in Britain, and was invited by Her Majesty the Queen to attend the grand opening of the museum. He was also a charter sponsor of the Air Force Memorial. Survivors include two daughters, Sindy Greene and husband Darin of Petersburg and Tiffeny Gonzales and husband Carlos of Petersburg; two grandchildren, Whitley Mendez and Chaz Gonzales both of Petersburg; one great-grandchild, Mikaela Mendez of Petersburg; one brother, Larry Alford and wife Marilyn of Slaton; one sister, Merrijon Newton and husband Arthur of Idalou; and one uncle, Jerald Bright and wife Grace of Petersburg. Memorials may be made to the First Baptist Church Food Pantry, 2001 Main, Petersburg, TX 79250. Online Condolences may be made at www.bartleyfuneralhome.net. We included the obituaries of his parents, John Calvin Alford and Nalta Eloise Bright Alford, in Texas Obituaries. From TX Births: Sidney Floyd Alford was born 2 Oct 1946 in Lubbock Co., the son of John Calvin Alford and Nalta Eloise Bright. *See AAFA’s Published Genealogies, #3. His lineage: Sidney Floyd 1946 TX1, John Calvin 1916 TX2, Earnest Floyd 1890 TX3, Needham Judge 1857 TX4, Jesse Powell 1828 LA5, Needham Judge 1789 NC6, Jacob 1761 NC7, Julius 1717 VA8, James 1687 VA9, John 1645 VA10.